Adoption applications are only considered for Kingston and Surrounding Areas. All Spay Neuter Kingston Initiative (SNKI) felines (adults and kittens) come from our managed cat colonies and all applicants receive mandatory home visits. SNKI has an adoption committee of volunteers, who review all applications. Sometimes, depending on the number of kitties we get in, the process can be lengthy; but we feel it’s worth it to ensure that our animals get to their forever homes. Thanks to social media, our stories make an impact on a larger scale. We reach people outside our community with huge hearts, but unfortunately, because we take our home visit responsibility seriously, it’s impossible to serve people outside our boundaries at this time. Please accept our heartfelt thank you for considering us, we are positive that there are other great organizations in your area that could use your help. The above table includes FIV/FeLV testing, spay/neuter, age-appropriate vaccinations, treatment for fleas and deworming, microchipping, and 6 weeks of free Shelter Pet Insurance. SNKI is 100% volunteer driven and all profits from our adoption applications go to veterinary costs and are non-refundable. If you are interested in adopting, please fill out our online adoption application. 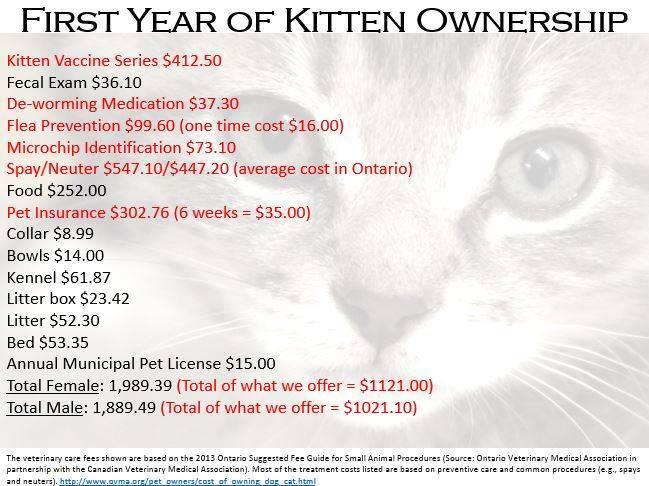 Did you know that in the first year of kitten ownership, one can expect to pay up towards $1989.39 (female) or $1889.49 (male)? It’s eye-opening when you have all the numbers in front of you. Ask yourself if you’re ready and we can’t wait to hear from you!